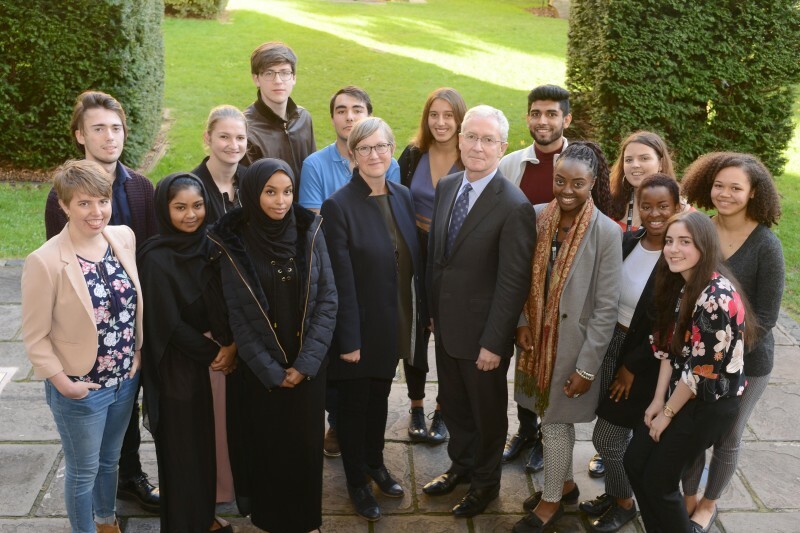 The first cohort of a pioneering new scheme, introduced by the University of Bristol to identify academic talent locally, will start their university journey this week. The Bristol Scholars initiative involves the University making lower offers to high potential local pupils – moving away from the traditional focus on grades and instead looking at the student’s potential as assessed by their teachers, taking into account any form of educational disadvantage. It was launched in December 2016 by the Secretary of State for Education, Justine Greening, to improve social mobility in a city where one in four children lives in poverty. Nine months later and the University is welcoming 42 Bristol Scholars from 17 local schools, studying a wide range of degree courses. Among the cohort are five students from Merchants’ Academy – the first from the school to study at the University of Bristol. They are among over 200 students who have progressed to the University through its various widening participation outreach schemes. “The Bristol Scholars pilot cohort is a varied, talented and engaging group – ingredients of brilliant students. They will bring a real diversity of experience and perspective to enrich our University. We hope their time here is rewarding and enjoyable. “The scheme is intended to capture the talent we know exists in our locality, to demonstrate the University’s commitment to Bristol’s schools and colleges and to provide alternative entry routes into our programmes. Bristol Scholars is the first initiative of its kind in the country and was introduced at a time when top universities faced calls to improve social mobility. It was developed in partnership with Bristol Learning City, a partnership of over 70 different organisations who are all working together to promote and improve learning opportunities in the city. The cohort is a diverse group – 76 per cent of those who were made offers are the first in their family to progress to higher education; 57 per cent are entitled to the post-16 bursary; 40 per cent are part of the Free School Meals cohort; and seven per cent are young carers. Of the 42 students who met the terms of their offer and accepted their place, 32 are from state schools and 10 are from independent schools. The cohort will receive pre-sessional support, access to a dedicated Bristol Scholars Adviser, bespoke study skills support, invitations to cultural events, a peer mentor and guaranteed internship. Those Scholars from low income families will also receive a one-year tuition fee waiver and annual bursary of £3,750. Recruitment has now started for the 2018 cohort with an extended application period until 15 January. Every school or college in Bristol which offers post-16 qualifications is able to nominate between five and 10 students, depending on the number of post-16 students it teaches. They will then receive a reduced, guaranteed offer for the course they wish to study. Eligibility for the scheme will be based on head teachers’ assessment of potential and progress, rather than examination results alone. Beranger Igiraneza, 19, who came from Burundi in East Africa in 2002, made it his life’s ambition to emulate the doctors who served in his war-torn home during the political upheaval. The former St Mary Redcliffe pupil achieved AAB in his A-levels and will now study Medicine, with ambitions to specialise in paediatrics. Emily Derrick, from Ashton Park School, starts a degree in Philosophy this week. She’s the first person from her family to go to university and has even inspired her mum to start an online degree. Janvi Vaja, who studied for her A-levels at Colston’s Girls’ School, was helped through IntoUniversity Bristol East’s Post-16 Academic Support programme and mentored by 2nd Year Law student Bijou Dunn, who was also the first person from her family to go to university. The 18-year-old got the results she needed to get a place on the Maths and Economics degree and has moved into halls this week. “My mentor told helped me with my Biology A-level and told me how great the teaching was at Bristol, which really made me want to apply.